Tomorrow, March 25, 2016, marks the 105th anniversary of the Triangle Shirtwaist Disaster. This fire killed 145 workers, most of them immigrant women who worked around 12 hours a day, 7 days a week for only $15.00. When the women protested these working conditions, the owners of the Triangle Shirtwaist Factory hired police to imprison those who were striking. The doors were locked to the stairwells, only one elevator was working, and there were no safety precautions taken (i.e. the installation of sprinkler systems, etc). It is important to remember the Triangle Shirtwaist Disaster as it caused the reform of worker’s rights and was directly connected to the Women’s Suffrage movement in New York. The fire at the Triangle Waist Company in New York City, which claimed the lives of 146 young immigrant workers, is one of the worst disasters since the beginning of the Industrial Revolution, and the disaster, which brought attention to the labor movement in America, is part of the curriculum in classrooms throughout the country. Told from alternating points of view, this historical novel draws upon the experiences of three very different young women: Bella, who has just emigrated from Italy and doesn’t speak a word of English; Yetta, a Russian immigrant and crusader for labor rights; and Jane, the daughter of a wealthy businessman. Bella and Yetta work together at the Triangle Shirtwaist Factory under terrible conditions–their pay is docked for even the slightest mistake, the bosses turn the clocks back so closing time is delayed, and they are locked into the factory all day, only to be frisked before they leave at night to make sure they haven’t stolen any shirtwaists. When the situation worsens, Yetta leads the factory’s effort to strike, and she meets Jane on the picket line. Jane, who feels trapped by the limits of her own sheltered existence, joins a group of high-society women who have taken an interest in the strike as a way of supporting women’s suffrage. Through a series of twists and turns, the three girls become fast friends–and all of them are in the Triangle Shirtwast Factory on March 25, 1911, the day of the fateful fire. I don’t know if I’ll ever be able to put a finger on why the story of the Triangle Shirtwaist Fire has stuck with me ever since I learned about it back in high school history. I’ve always had a big fear of fire, which could be part of it, but I’d like to say it’s because the lives lost there changed so many things in history. But maybe it was because I could identify with the historical accounts of the lives lost; teenage women, the age I was when I first learned about the disaster, who had to work ruthless hours for little pay in a booming industrial age of America, women who were locked in a building to prevent any unapproved breaks and stealing. While we learned about the Shirtwaist Strike as well, it was this disaster that really gave the strike arguments more power and recognition. Some of those battles we still fight today (i.e. Gender and Race wage gaps). Either way, suffice it to say that the Triangle fire is important. 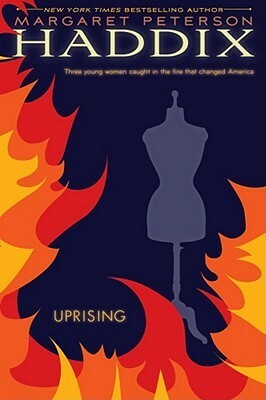 When I first learned there was a novelization of the Triangle Shirtwaist Fire, I was a bit skeptical. How long could you conceivably make a novel that features a fire that burns so hot and quickly that it killed so many people in a short amount of time? The fact that I have a big phobia of fire didn’t help my skepticism, because I was a little fearful of it causing some terrifying dreams. I could not be more happy about reading this novel. Haddix does a brilliant job at focusing on the Triangle Shirtwaist Factory from the beginning of Uprising, as she focuses on the close working conditions, and within a few pages of the first narrator, Bella, recounting her first day at the Triangle factory, there is a number of workers that walk out exclaiming, “Strike!” The narrative then goes into explicit detail of how these workers are exploited by being overworked, underpaid, and treated like third or fourth class citizens and how these women stood together and formed a large Garment workers Strike. The two immigrant narrators, Yetta and Bella, are so well done as individual characters. Bella’s voice is a bit weak and timid at the beginning, definitely befitting her character, but then grows continuously throughout the story into a character that is shown to really embrace her new life in America, no matter the hardships she has to endure. Yetta is fierce, independent, and extremely stubborn. Her narrative voice is so strong that it almost overshadows the other two characters for the majority of the novel, but I think that this was intentional and demonstrative on how fervent these women worked to establish a union and acceptable working conditions. Both Bella and Yetta worked so hard for so little just so they could support themselves and their families, and it is inspiring to read about their determination. The third narrator, Jane, I wasn’t expecting to like, because let’s face it, she seemed like a rich girl just looking to circumvent her father and get a little bit of attention, but she became much, much more than that. Haddix does such an eloquent job at making these characters so realistic that I felt like I lost three friends when the story ended. A large majority of the narrative focuses on the strike, implications of the strike, how strikes are formed, who funds the strikes, the mistreatment of those on strike, and how a union can be formed. That sounds utterly boring, right? Wrong. These parts of the story are so interwoven into the personal parts of the narrative that you don’t even realize that you are learning. You learn that the socialist movement really helped a gain a lot of support for this strike, you see the positive and negative aspects of immigrants coming to America at the turn of the century, you find that there were those who survived New York winters without shoes, much less jackets. You are put in the middle of the fire. The story does build to its inevitable end, the fire on March 25, 1911. I think that Haddix’s writing in the fire scenes is particularly eloquent for scenes where there is so much at stake. I cried my eyes out. 5 Bards for Bella and Yetta and Jane and all those who lost their lives in the Triangle Shirtwaist Fire. For more information about the strike, fire, resulting trial, victims, etc please visit this link.